Reading copy provided courtesy of Tor. Good review. Despite your anxiety I dont think the fanboy was a deterrent. I agree that this series is seminal, that is has stood by our generation. We have, in a sense grown up with it. For readers of heroic fantasy it changed the way fantasy was written: it got away from all the medieval tropes and "noble" characters to reveal the complexity of people that could very well be real. I think your pereceptiveness of the rand/egwene contrast is accurate. I am about to take up Knife of Dreams and your review has relieved some anxieties I had about whether the gathering storm would feel like it preserved the continuity and feel of the originals. Thanx. 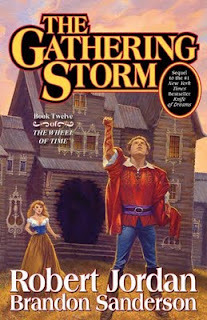 What Brandon was most successful at was making The Gathering Storm read like a Wheel of Time novel. It fits as part of the series and isn't just a novel written by some other guy using Jordan's name. I truly enjoyed the continuing Suian Sanche / Gareth Bryne plot line, especially because I think Sanderson wrote it better than Jordan would have. My jaw dropped at the Verin plotline, but I don't think Jordan could have made me tear up the way Sanderson did with his writing of the scene.